Here's some good news for those cooking their first Thanksgiving meal: if you aren't quite sure what you're doing with that turkey, you can dial for help. The Early Show Correspondent Melinda Murphy reported in 2003 that is precisely what her new friend might want to do. Aimee Barrett just got married and according to her mom, that means she has to cook this year's Thanksgiving turkey. Aimee's first turkey is for 25 people. She says, "It's crazy. I'm a little nervous." As it turns out, Aimee should be nervous. CBS gave Aimee a turkey to see if she'd know what to do with it. After struggling with the bird to cook and stuff it, she finally got to the stage of cooking it. "The oven's not on," she noted with embarrassed laughter," I'm going to make myself cry." Good thing for our blushing bride, help is only a phone call away for any cook in the country: The Butterball Turkey Talk Line. A gaggle of turkey experts stands ready with one-on-one counseling for panic-stricken cooks. Mary Clingman is the director. She says, "There's 51 of us. We're all food professionals. A third of these women even have a master's degree." The line has been around for 23 years. Carol Miller has been there for 21. But before she started the job, she whispers with embarrassed laughter, she had never prepared a turkey. 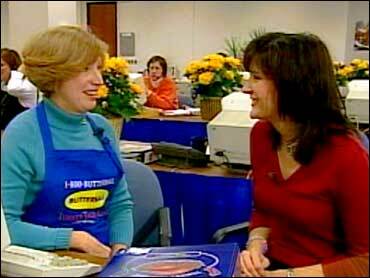 But not to worry, Carol and the others went to Butterball University. Butterball U has taught Carol lots. Of course, most calls are pretty routine witrh questions such as how long it takes to cook the bird. But some are a bit more unusual: "How do I pressure-cook a turkey?" a caller asked. To which Carol answered, "You're going to challenge me." And a few calls are truly memorable, like the man who wanted to cook a perfect turkey for his family after his wife died. Carol recalls, "Every day for about a week, he called one of the turkey talk line ladies and asked them a new question." Carol tries to make each call personal. She says, "I like to hear the voice and picture the person in my mind. It makes it a lot more friendly." She says that makes it easier - anything to get through the 8,000 calls on Thanksgiving Day alone, the day of ultimate turkey tension. Carol says, "Sometimes they're waiting for you to give them the go-ahead to take the turnkey out of the oven. There'll be a crowd of applause in the background because the turkey lady says they can now eat." So perhaps Aimee will be calling the turkey talk line that day. She says, "I would probably get to that, that morning. Are they 24 hours?" No. The line is open most days from 8 to 8 CST, but it's only open 8 to 6 on Thanksgiving Day. The number to call is 1-800-butterball. You can reach a turkey counselor through Dec. 26. To find out more, visit the Web site at butterball.com.